You know what tribe I belong to? Put your hand on a table. Now hit it with a rock. If it hurts, then you and I belong to the same tribe. The Hit-my-hand-with-a-rock-and-it-hurts tribe. Wanting to believe a thing is the first and biggest step. From that to believing is as easy as landing in the water after you’ve already jumped. It’s not that we found this New World a long time ago, it’s that we’re still making this New World right now. And a new world takes time. A free-range chicken or tofu in every pot, clean sustainable energy, liberty and opportunity for all… Don believes we’ll get there. And I want to believe he’s right. 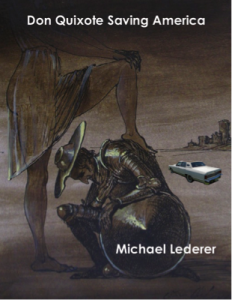 Michael Lederer is an American writer who lives in Berlin, Dubrovnik, and Cadaqués. His first novel, Cadaqués, was published in February 2014. He has just written his second novel, Don Quixote Saving America.